I know I promised my next post would be about Lionel Heymann and his secret life, but first I need to write about someone else, someone who was not in any way related to me, but who deserves to be remembered and honored. I will return to Lionel next time. In my last post I had asked for help in interpreting a sentence in the Steinheim Institute site describing what had happened to Willy Heymann. 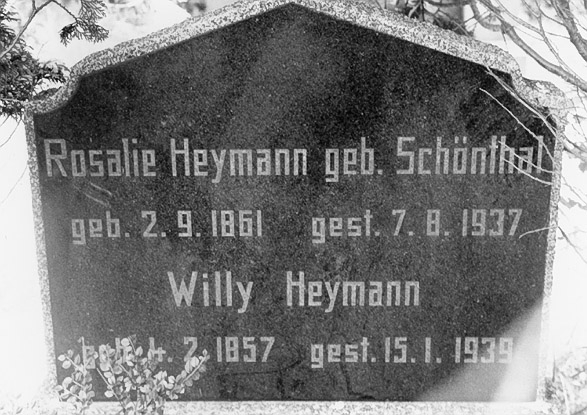 Willy Heymann wurde nach seinem Tod von dem 14jährigen Fritz Davids, der erst kurze Zeit zuvor aus dem KZ Dachau zurückgekehrt war, in das man ihn nach derPogromnacht mit seinem Vater verschleppt hatte, ganz alleine und heimlich zum Friedhof gebracht und begraben. After his death, Willy Heyman was brought secretly to the cemetery and buried by 14 year old Fritz Davids alone, who had returned only a short time before from the concentration camp of Dachau where he had been brought with his father after the [Kristallnacht, Nov. 9, 1938]. Recently back from the concentration camp, Fritz Davids experienced, two months later, how bad the Jews had fared. There was no respect even for the dead. The Jew Willy Heymann died at the age of almost 84 years old. Since nobody wanted to bury him or could, the 14-year-old Fritz put the corpse in a wheelbarrow and at dawn wheeled it to Boeckelter Weg (street name) to the Jewish cemetery, where he, fully in dignity of the time, shoveled a grave for the old man and spoke the Kaddish. David Cain and Jacob Heymann were also buried under such humiliating circumstances. Imagine being fourteen, being arrested and sent to a camp like Dachau. Then imagine coming back and finding what the Nazis had done to your community. And then imagine that fourteen year old boy having the courage and the moral decency to ensure a proper burial for one of his fellow citizens, an 84 year old man whose wife had died and whose three sons were in America. What an exceptional person this young boy must have been. That left me and some of my readers wondering about this brave fourteen year old boy, Fritz Davids. Who was he, and what happened to him? So this morning I checked my sources, and what I learned did not shock me, but it did break my heart. Fritz Davids, the son of Gustav Davids and Freidel Hext, was born in Geldern on April 4, 1924. He was named for his father’s brother, who had died in 1901 when he was just nine years old. Fritz was imprisoned again at Dachau on September 5, 1941, until May 4, 1942. He was then deported to the killing facility at Hartheim, where he was killed on July 2, 1942. Both of his parents and his aunt were also murdered during the Holocaust. 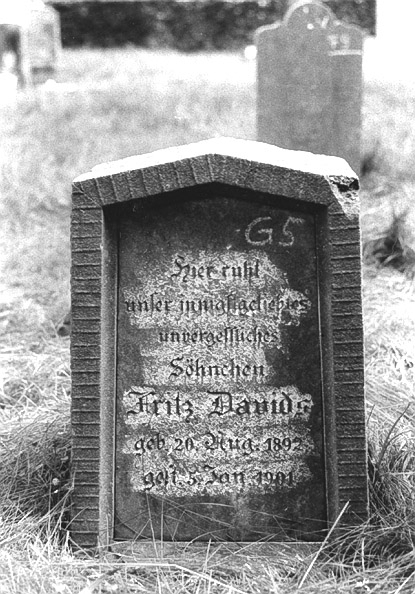 Fritz Davids was 18 years old. He did not get a decent burial. No one was there to say kaddish for him. May his memory be for a blessing. May we never forget his name. This entry was posted in Genealogy, Germany, Holocaust and tagged Dachau concentration camp, holocaust, Kristallnacht, Nazism by Amy. Bookmark the permalink. Such a lovely, well deserved tribute Amy. HARTHEIM – as the links tells you – was not a concentration camp but a place to murder persons who were declared “mentally ill” or handicapped. There were a number of institutions like this in Germany, and one in Austria. Actually a member of the extended family, Julius Mosbach, was also killed in such a terrible place. Right, I should have been more precise. The Bundesarchiv site describes it as a “killing facility,” so I will substitute that term. 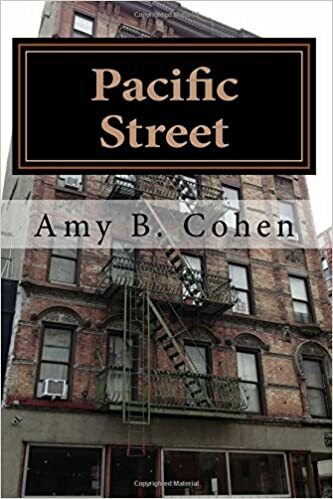 Oh Amy; I did wonder when I read your last post what had happened to that brave boy. Like you, I’m not surprised but I am so, so sad. I’m very glad that you have told Fritz’s story; he deserves to be remembered as one of the good people who remind us all of our common humanity. Yes, I agree. It’s one of those lost stories that should be remembered. Thanks, Su. Thank you Amy for sharing with us what happened to Fritz. When I was searching and found the “stumbling stone” for Geldern I noticed one hit mentioned his being in Dauchau in 1941-1942 but I dismissed it as it didn’t fit with his coming home from there and burying Willy in 1937. I thought there must be something wrong with the timeline. I did not think he would have been imprisoned in Dauchau twice. Such a sad ending. Thank you, Cathy, for helping me to learn what Fritz had done for Willy Heymann. So many died nameless and us remembered. Thank you for remembering Fritz and by so doing giving his name life. Thank you. I think his story will be haunting me. Harrowing. I am glad you have honoured Fritz by telling his story. Thank you, Karen. I hope you’re right. He deserves to be remembered. What an amazing young man. And I have goosebumps realizing that I am reading this on April 4, 2016 which would have been Fritz’ 92nd birthday. Thanks for pointing that out, Debi. Fritz would have been 92—imagine what he might have accomplished in the many years that were stolen from him.